I also thought it would be nice to actually draw lines, like that old "game boy" Etch-A-Sketch. Pre-Warning: This isn't an MVC tutorial, so don't expect to conquer this subject here! It is just storing the state (Direction and Pixels) and notifying of changes to this state. What about the View? It is possible to create a separate View class but, as the View should be fairly passive, the Form class itself can provide/be the View. This is different to Java where we write code to construct the GUI. (We could, of course, do the same in C#, which I know is many people's preference.) In this case, the construction of the GUI and its consideration as "the View" doesn't really cause us any pause for thought. With C#, and the Form Designer, it seems unnecessary, overkill, to go to the lengths of creating a distinct View class. That is, in my opinion. Anyway, the View (our Form) stores a reference to the Model, listens for changes in the Model, and updates the UI, by providing information in a Label's Text and drawing lines. This is where MVC starts to unravel a little. Shouldn't the Controller tell the View to draw lines? Should the Controller call a method of the View to draw lines? The inbuilt ability of a WinForm to draw on itself makes it a little awkward for the Controller to commandeer this feature. Now the Controller is supposed to respond to UI events, to Button clicks (in the Form/View). How do we transfer this event-processing to the Controller? 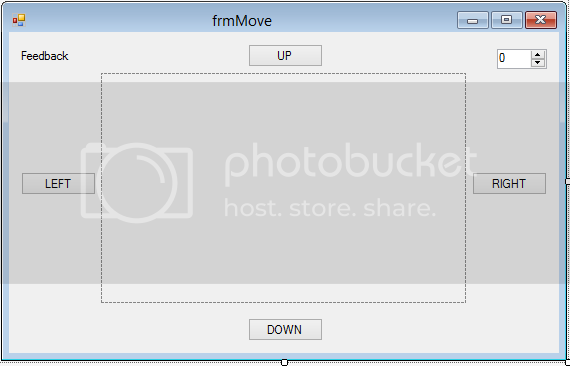 Using INotifyPropertyChanged (again)? With Custom Events? It just doesn't seem "right" that, for example, click-events in the Form class would raise an event that the Controller would listen for, and the Controller would then call a method of the Form to draw on itself. Anyway, I'm over-thinking this. Besides, it is just a mini-project which I knew was likely to end in tears (sad face). Let's continue. I decided to use Custom Events, Directionchanged and PixelsChanged. 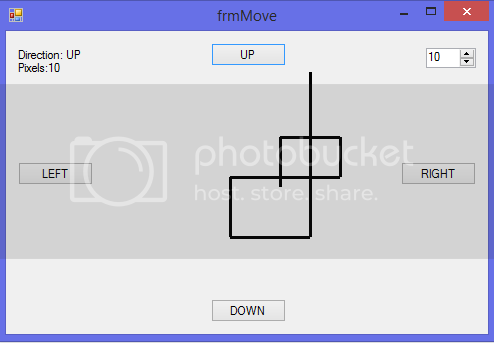 When a Button is clicked, or the pixel-value is increased (using a NumericUpDown Control) it raises either of these events. The Controller listens for these events and updates the Model. The Form/View is listening for these changes to the Model, and responds by providing feedback in the Label and re-drawing the lines. This hints at why MVC is typically more suited as a Web framework. In a website the View, the web page, is stateless. The Controller receives responses and will then send commands back to the View (or with the View). Was this a useful exercise? Have I learnt much about MVC? Maybe. I suppose I've managed to confirm that WinForms and MVC are not a good match, and I've had a little more practice with Custom Events. The application itself is reasonably interesting. detailing the history and evolution of MVC and MVP to help understand their differences. 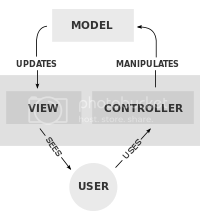 One common misconception about the relationship between the MVC components is that the purpose of the Controller is to separate the View from the Model. While the MVC pattern does decouple the application’s domain layer from presentation concerns, this is achieved through the Observer Pattern, not through the Controller. The Controller was conceived as a mediator between the end user and the application, not between the View and the Model. Yes, I was encouraged by the earlier example I mentioned which didn't draw anything. I added the drawing as an additional presentational feature, I didn't consider adding the lines to the model. That makes sense and provides a less supine model.